Heat oven to 350°F (325°F for dark or nonstick pans). Grease or spray two 8- or 9-inch round cake pans. In small bowl, toss 1/2 cup of the chocolate chips with 1 tablespoon of the cake mix. In large bowl, beat remaining cake mix, the water, oil, egg whites and drink mix with electric mixer on low speed 30 seconds, then on medium speed 2 minutes, scraping bowl occasionally. Stir in the 1/2 cup chocolate chips. Pour into pans. Bake and cool as directed on box for 8- or 9-inch rounds. In small bowl, stir 1 cup of the frosting with 10 to 12 drops green food color. Stir 10 to 12 drops red food color into remaining frosting. Frost sides of cakes with green frosting; press green jelly beans into frosting. Frost tops of cakes with red frosting; press remaining 2 tablespoons chocolate chips into frosting for seeds. If desired, cut cakes crosswise in half and arrange "slices" randomly on tray. To serve, cut into wedges. Store loosely covered. Now’s the time to start thinking about summer entertaining! It's when we’re itching to try new recipes and party foods. 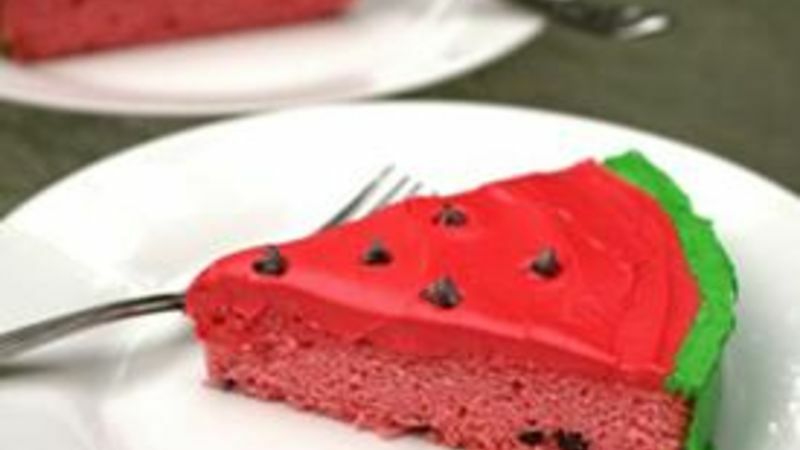 This watermelon cake was on the top of my list, since it can be served at backyard BBQ's, 4th of July gatherings, pool parties and everything in between. It starts with a Betty Crocker cake mix, and it’s easy to design. The addition of pink lemonade concentrate adds a slightly sweet-tart flavor, and is used in place of part of the water called for on the box. Use red and green food coloring and top off with mini chocolate chips for seeds. The watermelon look adds to the summery feel of this easy-to-make pleaser! Fish Cake-Reel in this sweet catch of the day in no time! Perfect for a theme party or summer get-together. Celebrate spring, summer, a birthday or any day with a butterfly-shaped cake. Print out this template and use it as a guide to cutting and assembling your butterfly. An easily doctored up cake-strawberry shortcake with an almond glaze.